You never really know another person until your relationship is tested–as, for example, when you are running for your lives to escape from a cursed Mayan temple as it is about to crash down around you. Will the other person return to offer a helping hand when your tools are accursed? Or will they strive to save their own skin? These are questions it would be good to know the answers to in advance. Thank goodness for Escape: The Curse of the Temple, which will allow you to test the strength of your relationships before you face a real life-or-death crisis. But is this an adventure worth taking? Find out below! Escape: The Curse of the Temple is a real-time cooperative dice-rolling game for 1-5 players that plays in exactly ten minutes. (The game comes with a soundtrack that acts as a timekeeper.) The goal of the game is to escape (…) the curse of the temple (…). 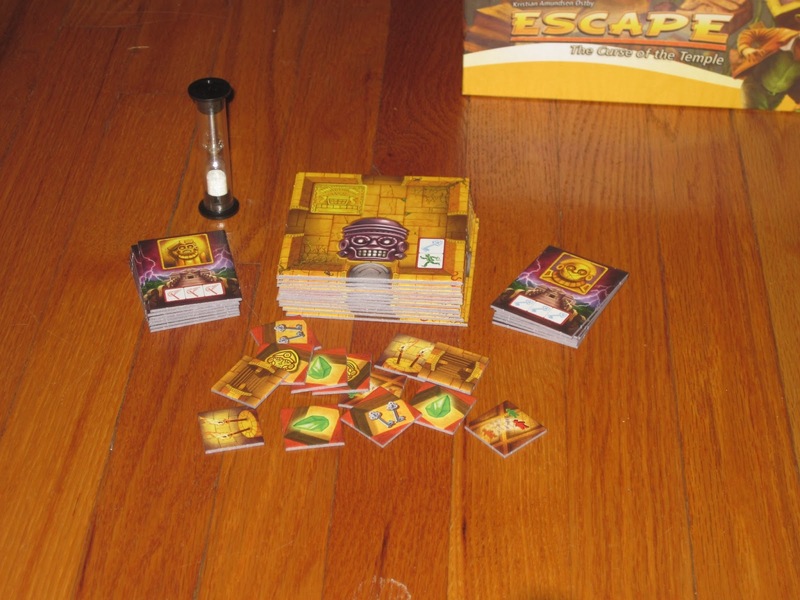 As Escape is a cooperative game, players win only if all players have escaped before the temple crashes down. Players weaken the curse by activating magic gems throughout the temple, which makes escaping easier to do. A player’s tools: an adventurer pawn, five custom dice, and a button in case, in the hustle and bustle of escaping, players forget their identities. 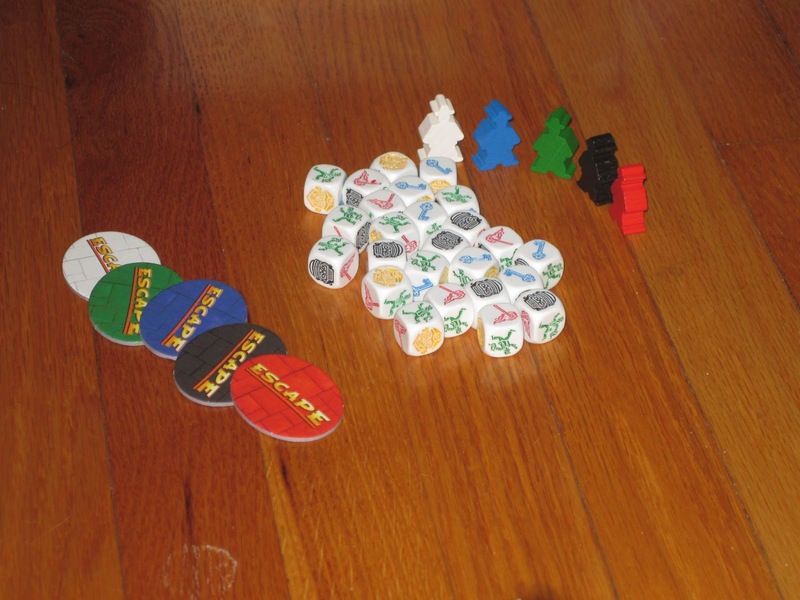 At the start of the game, players receive an adventurer pawn and a player button in their color as well as five custom dice. The faces on the custom dice bear icons of a green running man (two sides, used primarily for movement), a red torch (used for movement and activating gems), a blue key (used to move, activate gems, and escape), a black accursed mask (which cannot be rerolled), and a golden mask (which frees up two accursed dice). Players shuffle the temple room tiles and place two random tiles adjacent to the main chamber. Player pawns start in the main chamber. A number of gems start on the gem depot dependent on the number of players. Once this is setup, players start the soundtrack. At around the three-minute mark and the six-minute mark, players will hear a gong on the soundtrack. This means players must make it back to the starting chamber before they hear the sound of a door slamming shut. If the door is shut and a player is not in the main chamber, that player loses one die for the remainder of the game. The gem depot. The more gems are on the depot, the harder it will be for players to escape. Activating gems moves them from the gem depot onto the chamber tiles. Once the exit chamber is discovered, players may attempt to leave the temple by rolling key symbols in that chamber. The more gems there are in the gem depot, the harder this is, as players must roll one key more than the number of gems in the depot (so if there are two gems, players must roll three keys). If a player escapes, she may pass one of her dice to a teammate still in the temple. At the end of ten minutes, if any adventurer remains in the temple, the players lose. If all players have escaped, the players win. The optional expansion modules, curses and treasures. Escape: The Curse of the Temple is chaotic. It’s simple. It’s also one of the most fun board gaming experiences I’ve had. Part of what makes Escape so great is the attention paid to its components. Wow, these are fantastic components! The dice are custom engraved, which is a nice touch. While they’re a smidge smaller than I’d like, the engraving more than makes up for it. 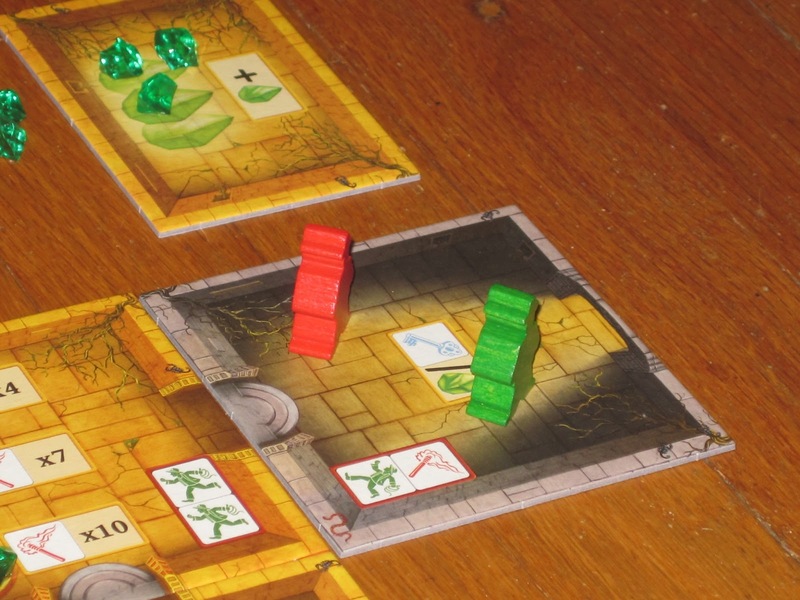 The chamber tiles, curses, and treasures are all on sturdy cardboard, and the art of the game is evocative. It (and the adventurer pawns) sets the tone for an experience not unlike the Indiana Jones movies (which is a huge plus for me). Further aiding in the tone department is the soundtrack included with the game. The game also comes with a sand timer, but I can’t imagine playing this game without the soundtrack. Not only does it keep players from going over the ten-minute time limit, it also includes music and other thematic sounds to build tension. (The soundtrack comes with options, though: if you prefer minimal background noise, there’s a track for that.) Escape is a decent game in its own right, but it’s the attention paid to the components and soundtrack that push it over the top. The game comes with twenty-five custom etched dice and five cool-looking adventurer pawns, along with the other components. One of the things that makes Escape interesting is the modular board. Because the chambers of the temple are shuffled before the game begins, the game plays a little differently each time it hits the table. 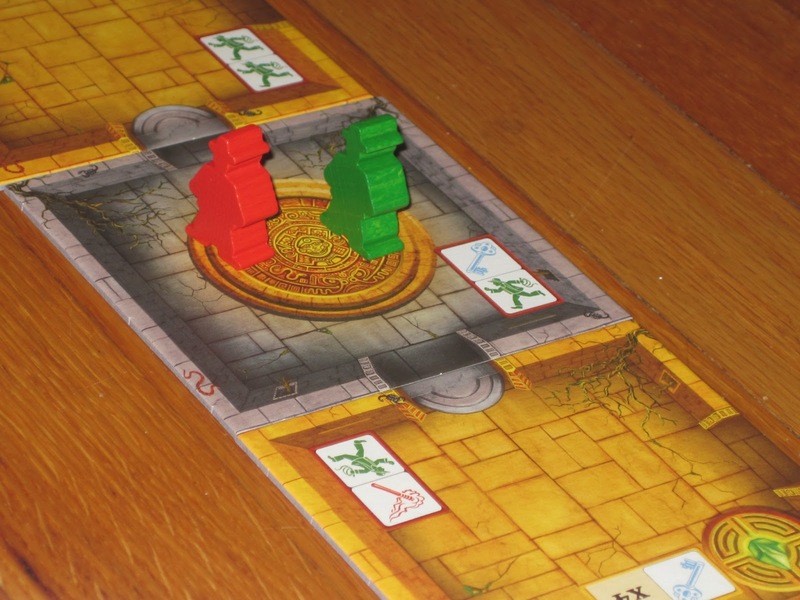 The exit chamber is shuffled into the last few tiles, so players must explore the full temple if they are to make their escape. This can make things that much more hectic as players must make it back to the main chamber two times during the course of play. 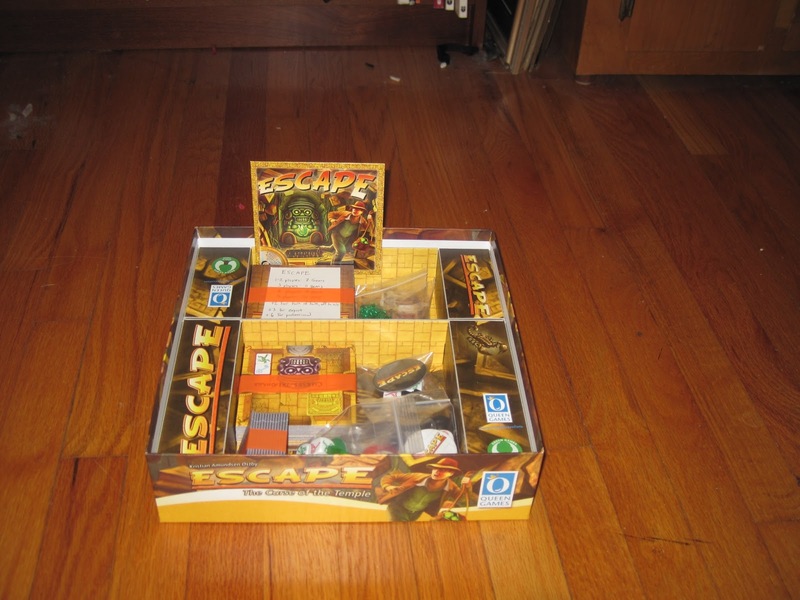 I also like the real-time cooperative aspect of Escape. One of the main drawbacks of cooperative games that you’ll hear is the alpha player problem, where one player dictates to other players what they should do, and the game is essentially single player. Escape mostly eliminates this problem by making the game fast and hectic. Players don’t have much time to focus on other players: all players are playing at the same time, so they must focus on their own part to play in the game. But the game still is cooperative. Players only win if all players escape the temple, so it’s in players’ best interest to help their teammates. If a player has only accursed dice faces showing, it’s not uncommon for other players to run back and help them (and for that player to bark for help). And all players benefit when gems are activated (it makes it easier to escape! ), so lending a helping hand in the gem rooms is an obvious good move. The starting chamber. Which route should we take? Escape is similar in this respect to Space Alert, another real-time cooperative game. Escape differs from Space Alert in more than just theme, though. While Space Alert is a real-time cooperative game for primarily gamers, Escape is a great game for gamers and their families. The rules are much simpler, and there is more margin for error in Escape than in Space Alert. 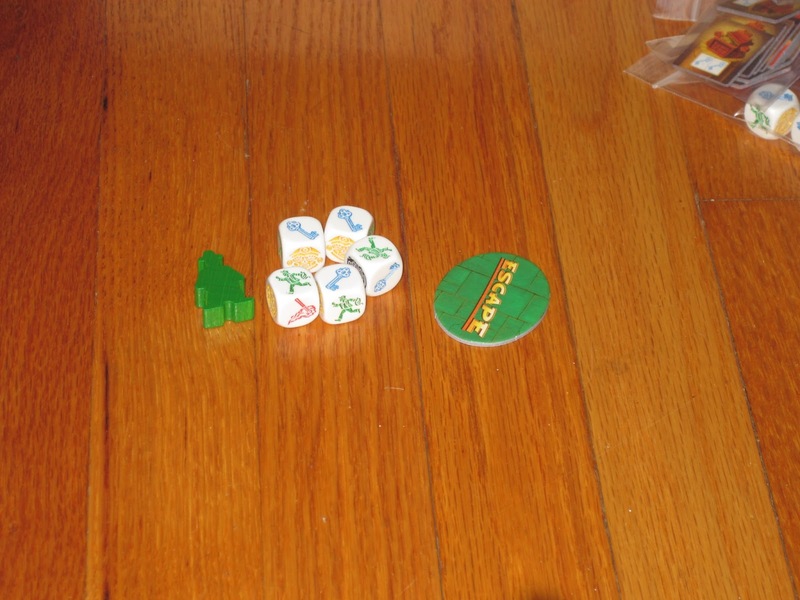 I played this with my niece and nephew–ages six and eight–and it was in the harder range of games they can play. While we lost both games we played, the second one was close, and I think they would have understood the game on a third play. And even though they didn’t fully understand the game, they had a blast anyway. And I like the game for this simplicity. The concepts are easy to teach, so players can jump in and contribute right away. I like that cooperative games usually allow for this anyway, since more experienced players can take the lead, but in Escape, players know what they need to do and can do it right out of the box. With Pandemic, for example, players often don’t know at the outset what the best course of action is. Should I try to contain outbreaks? Should I build research stations? Should I discard precious cards to fly to another part of the world? It doesn’t take long for these decisions to make sense, but it does usually require some guidance. Escape, on the other hand, has a very concrete goal–escape!–and a very simple means of achieving it–roll these dice as fast as you can! So close! In the exit chamber with only three gems on the depot. ROLL! Even more than this, the game comes with an audio tutorial to help players learn the game. (It saves my voice: I don’t have to do the explaining for once!) 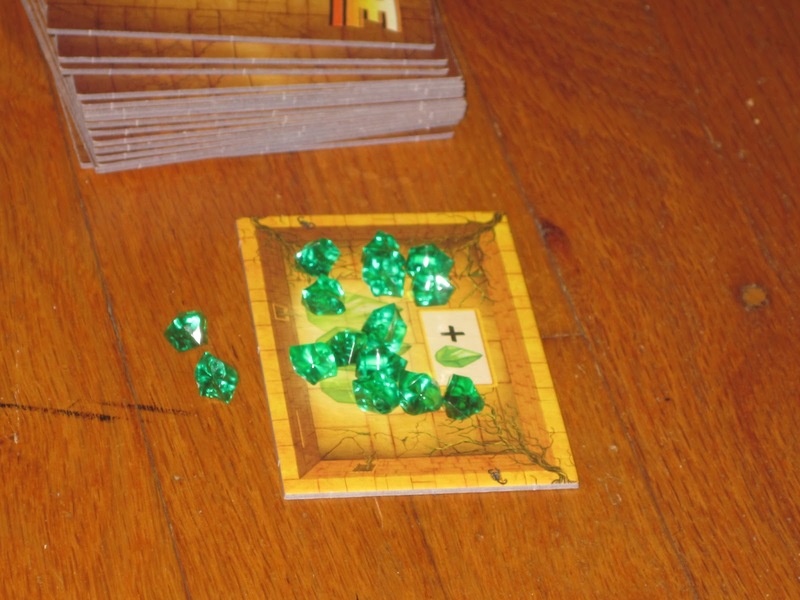 Unfortunately, there are a couple of errors on the tutorial track (namely, golden masks free up two black dice and players must roll keys for each gem plus one), and some omissions, but as long as you have read the rules, you can play the game correctly. Players that I’ve taught the game to have been unable to hold back smiles from the very beginning because the tutorial, again, helps set the mood for the game. If there’s anything to be said against Escape, it’s that the game is a little on the easy side. The two-player game is very easy, and while the game gets progressively harder the more players are at the table, it doesn’t take too many plays for teams to coalesce and figure the game out. Everything that comes in the box, save the rulebook. Escape: The Curse of the Temple will not be for everyone. It is not at all a strategy game (though the game does require some skill in quickly assessing and allocating dice rolls). It is a loud game, with the dice rolls and the soundtrack and the shouts to your comrades for help. (My wife and I play after our son goes to bed by putting placemats down on the table to reduce the noise. And we try–try–not to shout.) Escape is a bit gimmicky, and time will tell if it has staying power. It is also expensive for a game that plays in just ten minutes. I, however, have had a wonderful time with this game, and I look forward to every play. It’s a great value for what you get in the box, especially considering the development work on the soundtrack (and the additional support through new tracks available on the publisher’s website). 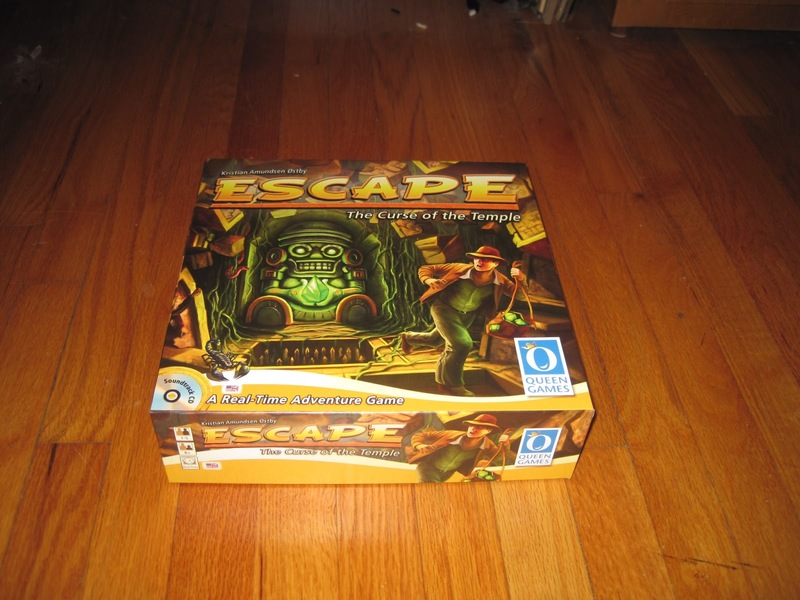 Escape is not a game that will get played over and over in a night, but I can see it being played many times over the course of several game nights. And I’ve never played just one game when it has come out. Players inevitably want to escape again–or die trying.